The Red Cow campaign for use with HeroQuest Glorantha consists of two parts. In the first part, The Coming Storm: The Red Cow Volume I, we were introduced to the Red Cow, the clan famous for the red cows it breeds and trades that make it the envy of many of its neighbours. Part of the Cinsina tribe, itself part of the Jonstown Confederation, the Red Cow sits at the heart of the Kingdom of Sartar in Dragon Pass. In describing the Red Cow clan and its leaders and notable figures, its allies, enemies, and their aims, The Coming Storm: The Red Cow Volume I set up the clan on a knife edge, riven by factions with no single fiction dominating the clan—the Moon Winds have converted to the worship of the Seven Mothers and welcomed the Lunar occupation forces; the Free Sartar faction supports rebellion and its campaign of guerrilla warfare against the Lunar Empire and would kill the Moon Winds; the Conquering Storm concentrates on local matters, old feuds and slights, to keep the tribe strong and its neighbours weak; the Wolfskinners want to kill the Telmori, the werewolves to the east, even being prepared to work with the local Lunar general to wipe them out; and the Eye of the Hurricane which does not want the clan to involve itself in outside affairs, whether it is involvement in the rebellion against the Lunar Empire or the foretold Hero Wars which are to happen soon. Broddi Strong-Kin is both clan chieftain and head of the Eye of the Hurricane faction, and so has the difficult task of maintaining the balance between the rivalries and politics of the factions, the clan, and the tribe. It is into this rich, detailed set-up that the player characters come to the fore. As members of the Red Cow, they are clan warriors, hunters, herders, healers, farmers, priests, and more, who through their decisions and actions have the potential to influence and eventually, even determine the future of the clan. The opportunity for them to do is is presented in the second part of the campaign, The Eleven Lights: The Red Cow Volume II. This is the campaign proper, chronicling the story of the clan from 1618 until 1625, covering the events, season by season, that lead up to the outbreak of the Hero Wars. These of course, include the Lunar campaigns throughout the period, the death of Orlanth and the Great Winter which followed, and the Dragon Rise which struck the death knell of the Red Emperor’s attempts to occupy Dragon Pass. Yet the story of the Red Cow clan is not about its involvement in these events, but how its people react to them, cope with them, and above all, survive them. It should be no surprise given the level of detail paid to the Red Cow clan and its allies and enemies in The Coming Storm: The Red Cow Volume I, that campaign is primarily location based. The player characters may travel far from their homeland—in one instance, very, very far—but they always come back and their ultimate concern is always the fate the clan. In the process, they will become involved in dealings with other tribes and clan, in dealings and death with werewolves, suffer under the yoke of the Lunar occupation, and worse—much worse, but again, it is their fellow clan members whom they have to return to deal, and they all have their own ambitions. To get the very most out of The Eleven Lights: The Red Cow Volume II, the Game Master will need access to several books beyond just The Coming Storm: The Red Cow Volume I. Primarily, these are the Sartar Companion and Sartar: Kingdom of Heroes, which add wider background, but in the main provide further scenarios and heroquests that the Game Master can run in addition to those given in The Eleven Lights: The Red Cow Volume II. Also of note is Hamlet’s Hit Points, Robin D. Laws’ examination of story beats—actions and actions within a scene—to help with staging the campaign’s many episodes. Of course, the Game Master does not have to read Hamlet’s Hit Points before running the campaign, but it might be a helpful option all the same. The majority of the book is devoted to years that the campaign covers, chapter by chapter. The first chapter introduces The Red Cow campaign, explains how the book is organised, and provides some advice for the Game Master on running the campaign. Each of the yearly chapters is organised into sections entitled Conflicts, The Ring, The Hero Wars, and Important NPCs. Conflicts details conflicts that threaten the Red Cow, both within and without; The Ring covers events concerning the clan’s leadership; The Hero Wars provides information on events which might affect the clan—both local and further afield; and Important NPCs lists everyone who has a role to play in that particular year. The chapters then give the various episodes which take place that year. Like the chapters themselves, these are organised in the same fashion. Each provides a starting point with ‘Begins With’, lists the Cast, explains the Situation and gives possible Twists, lists Connected Episodes as well as the Acts, Scenes, and Beats in the Episode, before going through the Episode, Act by Act, and finally, giving some advice on running the Episode and discussing how it might play out in ‘Play of the Game’. These two formats are adhered to throughout The Eleven Lights: The Red Cow Volume II and together help the Game Master run the campaign. Individual Episodes vary in length, some may take a session or less to finish, others may take multiple sessions to complete. In addition to the various episodes in each of the year-by-year chapters, the first chapter also includes a number of ‘general’ Episodes. These cover common activities which the clan often engages in, such as conducting cattle raids, sending emissaries to other clans, feuding, patrolling, trading, and so on. These are designed to be slotted into the ongoing campaign as needed, with many being listed under the Connected Episodes section of each Episode. In comparison to the great events covered by Episodes in the year-by-year chapters, these are perhaps not quite as exciting, but they do add to ongoing drama. Also included in this chapter is a Heroquest particular to the Red Cow clan—‘The Stealing of the Giant’s Cow’, which the player characters are likely to undertake at least on one year in order to ensure the quality of the clan’s cattle. The campaign opens in 1618 with ‘The Missing’, a crisis involving sickness among the clan and children having disappeared. It is a relatively gentle, and charming, introduction to the campaign, but it gets the player characters involved in clan affairs and it gets them dealing with other members of the clan from the off. It is followed by Episodes which push the player characters to make choices as events bring both them and the clan into conflict with its long-term enemy, the Emerald Sword clan of the Dinacoli. Episodes in later years continue this conflict to varying degrees, but the focus will shift to one of survival as events outside of the clan’s control impinge upon it again and again. Ultimately, circumstances will call upon the player characters to undertake a longer, much more involved heroquest which has great consequences for the wider world. This has a truly epic, magical feel to it and any player characters who return from it are heroes, ones ready for the difficulties the clan must face after the campaign (many of which would be worth exploring should The Eleven Lights: The Red Cow Volume II ever receive a sequel). The challenge in running The Eleven Lights: The Red Cow Volume II is twofold. First, as a community-based campaign, it involves a lot of NPCs, not just those listed in The Coming Storm: The Red Cow Volume I, but also those added by the Game Master. There are a lot to keep track of in the campaign, but The Eleven Lights: The Red Cow Volume II gives advice on handling multiple NPCs and it limits the numbers involved from Episode to Episode. Second, there is a great deal to take in when preparing the campaign, nearly all of it in the pages of The Coming Storm: The Red Cow Volume I before the Game Master has got to the running of the campaign itself. Overcoming this is a matter of careful preparation and taking notes prior to running the campaign, and again, the episodic nature of the campaign means that the Game Master should be able to avoid being overwhelmed by too much information. For the players, the challenge is knowing that the actions of their characters and the decisions they make will have consequences. Promises made, connections forged, alliances made, help rendered, and their reverse will have some kind of impact upon the outcome of the campaign. The many NPCs and factions have their own agendas and so will often require something of the player characters if they need support or assistance. Many of the decisions made will not have any consequences until much later on in the campaign when the player characters have a much larger role in the tribe. 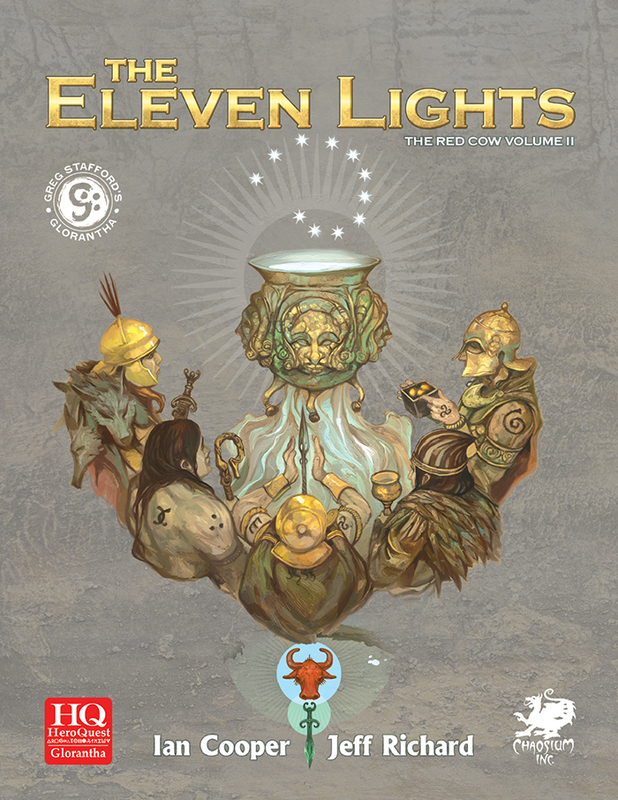 Physically, The Eleven Lights: The Red Cow Volume II adheres to Chaosium’s now standard, professional degree of presentation. Although a slight edit is needed here and there, the book is well written and well presented. The artwork, a mix of full colour and black and white, old and new, is excellent and helps to bring to life the fantastic world that is Glorantha. For decades, the struggle of a Sartarite clan to win its freedom and throw off the yoke of the Lunar Empire has been one of the classic campaign set-ups for Glorantha. The Eleven Lights: The Red Cow Volume II together with The Coming Storm: The Red Cow Volume I, enables Gloranthaphiles to explore that set-up to its fullest with a superb community-based campaign. It provides a great, sometimes epic, storyline which the Game Master can tailor to her players and in playing through the campaign, it is their characters that will decide the fate of the clan and their home. Together The Coming Storm: The Red Cow Volume I and The Eleven Lights: The Red Cow Volume II form a great community-based campaign which give the player characters a home and a clan to care about.